For a long period it seemed a new fine dining restaurant opened in Scotland’s capital on an almost monthly basis. Excellent restaurants like Oloroso, the Tower and Harvey Nichols joined the established stars, offering Edinburgh visitors and residents a fabulous choice of plush places to enjoy fine wines and gourmet cuisine. One of the last to open in a tide which has since slowed, was Vermilion, the fine dining option within the city’s Scotsman hotel. The Scotsman sits in a commanding position above Waverley train station. It is a super-luxury five star hotel, with a cosseting atmosphere of subdued colours and lighting, plush carpets and fabrics, and quite a clubby atmosphere. The building was once the historic home of the Scotsman newspaper, and is an iconic part of the cityscape that includes Edinburgh Castle and the Royal Mile. The hotel retains lots of period features, but is splashed with innovative cutting-edge interior design, like the stunning stainless steel, 16 metre swimming pool.I had eaten in Vermilion in the week it opened in summer 2002. I enjoyed very fine food, but was told the complete wine list was not yet in place, nor some of the details of the dining room. I decided I needed to give the restaurant time to settle down before reviewing it, and vowed to return. The impetus to do so came recently, when I received an intriguing press release announcing the launch of The Screening Room, a Sunday-evening entertainment package that offers a meal in Vermilion, followed by the screening of a classic film in the Scotsman’s very own, and very exclusive private cinema. In June 2003, I set off to try this promising new venture for myself. The Screening Room kicks off at 6 pm every second Sunday, with a glass of Champagne in Vermilion’s cocktail bar. 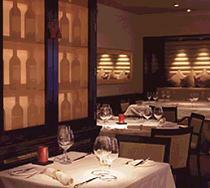 At around 6:30, guests take their seats in the restaurant, which is reserved for their exclusive use. Vermilion is a cosy, intimate restaurant, with deep red carpeting and lots of atmospheric mood lighting. Well-napped tables leave plenty of elbow room (the restaurant seats only 30) and a striking effect has been created with row upon row of fine wine bottles sitting on back-lit shelves which surround the room. Only faintly visible through diffusing screens, this simple but very clever device creates a tantalising sense of expectation about the food and wine experience that lies ahead. The package includes a starter and main course from a limited choice menu. A Tian of crab, langoustine and Granny Smith apple was beautifully fresh; a chilled tower of the finely chopped ingredients bound in a light mayonnaise was sandwiched between paper-thin discs of celeriac root, and topped with a scoop of citrus sorbet. The sweetness of the melting sorbet added an intriguing freshness to the rich flavours of the dish. With a respectful nod to oriental cuisine, young chef Chris Smart created a lovely main course; a breast of aromatic duck was sliced atop a Shitake mushroom and star anise-flavoured risotto. This was a fine dish, with the duck not over-cooked, but moist and soft-textured, and the risotto dark and earthy. The wine list at Vermilion runs the gamut from well-chosen, affordable bottles (Graham Beck’s South African Cabernet Sauvignon was a good match with the main course at £20), to mature bottles of Burgundy and Bordeaux. 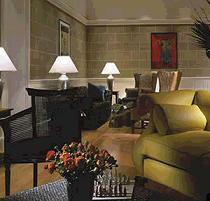 At around 7.45 the party moves downstairs to the secret jewel tucked into a lower floor of the hotel. The Screening Room is an air-conditioned, state of the art cinema, with the wood-panelled atmosphere of a 1920’s theatre. 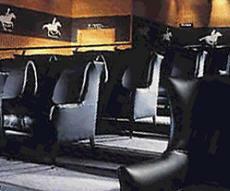 The cinema seats only 50, in individual wing-back chairs upholstered in soft black leather. This is the ultimate decadence for cinema-lovers; spacious, quiet and supremely comfortable, and the complete antithesis of the soulless modern multiplex. As the lights are dimmed, the meal is completed with a witty and fun touch – make your choice from a range of Ben & Jerry’s ice-creams. The Screening Room’s programme is put together by film buff Jason Hall, and each evening will include a short film – many from independent Scottish film-makers – and a classic movie. Hall intends the club to be a feel good antidote to Sunday evening blues, so though the odd upbeat arthouse movie might be scheduled, the programme includes the likes of The Italian Job, Some Like it Hot and Breakfast at Tiffany’s. I enjoyed the nostalgic romanticism of Woody Allen’s Purple Rose of Cairo. The Screening Room is a terrific idea that deserves to succeed. The evening package costs £35 per person, and includes Champagne or cocktails, the two course dinner and the movie. For me this is a very reasonable price for such an exclusive and indulgent treat. To satisfy licensing conditions you must become a lifetime member of the club for a token fee of £1. A limited number of movie-only tickets will be on sale for each event, priced at £6.50. Now roll-on winter, when losing yourself in the cosy atmosphere of Vermilion and the Screening Room for an evening deserves to be one of the hottest tickets in town.